PM Staff Visits With Don Durant, TV's Johnny Ringo - Coming in Issue No. 5! Shortly after wrapping up Issue No. 4 ("American Patrol") the PM staff road-tripped back in time to visit Don Durant, TV star of "Johnny Ringo." Don had recently paid the world's highest price to acquire the rare and expensive Marx Johnny Ringo Western Frontier playset -- and we were there to cover it's opening and set up. Don happily began to open his set, pulling out bag after bag. The rarities began spilling out: red wagon with all accessories, yellow wagon, the Johnny Ringo figure, the tin litho cabin (still flat and unassembled, in pristine condition) -- and then he began to snap pieces off the sprue. "Wait a minute, Don -- that is extremely expensive stuff. It could lose some of its value if you do that." Frozen for just a heartbeat, Don considered leaving the set unassembled. "What the heck, " he mused. "I've waited this long ...."
Did Don actually assemble this mint rarity? Did we cover every exciting moment for PM? Find out in Issue No. 5 as we bring you the full story of TV's most famous playset, "JOHNNY RINGO! 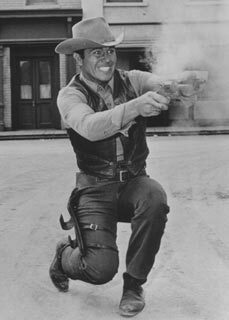 this exact pose of Johnny Ringo in 54mm plastic!